Let's take a close look at the latest employment report numbers on Full and Part-Time Employment. Buried near the bottom of Table A-9 of the government's Employment Situation Summary are the numbers for Full- and Part-Time Workers, with 35-or-more hours as the arbitrary divide between the two categories. The source is the monthly Current Population Survey (CPS) of households. The focus is on total hours worked regardless of whether the hours are from a single or multiple jobs. The Labor Department has been collecting this since 1968, a time when only 13.5% of US employees were part-timers. That number peaked at 20.1% in January 2010. The latest data point, over eight years later, is lower at 17.2% last month. Here is a visualization of the trend in the 21st century, with the percentage of full-time employed on the left axis and the part-time employed on the right. We see a conspicuous crossover during the Great Recession. 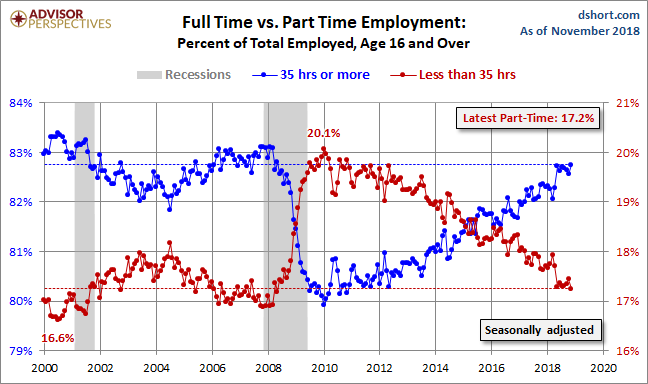 Since early 2016, the two cohorts have slowly drifted apart, with full-time employment gaining. Here is a closer look since 2007. The reversal began in 2008, but it accelerated in the Fall of that year following the September 15th bankruptcy of Lehman Brothers. In this seasonally adjusted data, the reversal peaked in January of 2010. The two charts above are seasonally adjusted and include the entire workforce, which the CPS defines as age 16 and over. A problem inherent in using this broadest of cohorts is that it includes the population that adds substantial summertime volatility to the full-time/part-time ratio, namely, high school and college students. Also, the 55-plus cohort includes a subset of employees that opt for part-time employment during the decade following the historical peak earning years (ages 45-54) and as a transition toward retirement. 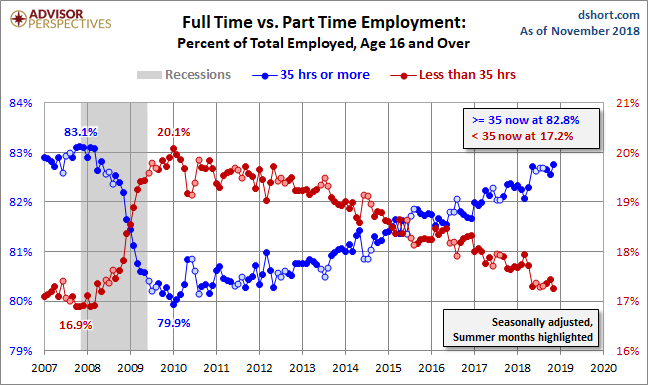 The next chart better illustrates summertime volatility by focusing on the change since 2007 in full- and part-time employment for the 25-54 workforce. Note that the government's full-time/part-time data for this cohort is only available as non-seasonally adjusted. To help us recognize the summer seasonality, the June-July-August markers are shown in a lighter color. These months are more subject to temporary shifts from part-time to 35-plus hours of employment. The 12-month moving averages for the two series help us identify the slope of the trend in recent years. The moving averages are, so to speak, moving in the right direction, but they have yet to meet continuously.